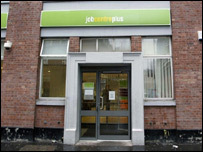 Union leaders have warned of fresh strikes at the UK's job centres over deteriorating service levels. The warning comes as a committee of MPs highlighted "catastrophic failure" in services last summer. The Work and Pensions Select Committee said job cuts at Jobcentre Plus led to a "truly appalling" level of service. The Public and Commercial Services Union said the Department of Work and Pensions could not continue to bury its head in the sand over the problems. Its general secretary ,Mark Serwotka, said the department should halt its programme of cutting jobs, which has already led to 15,000 posts going from a target of 30,000. The MPs' report concluded that the efficiency drive at the agency had been poorly planned and should be slowed. Mr Serwotka added: "This report supports our view that the efficiency programme is having a disastrous impact on services and that the DWP can't continue slashing jobs whilst services teeter on the edge of meltdown. "With a separate report earlier in the week showing 21 million calls going unanswered in the DWP, it is now time for the department to halt cutting jobs and assess adequate staffing levels. "The report offers an opportunity to find a positive way forward but, if one is not found, our members, who in the light of the report were right to take action earlier in the year, may take action again." Staff and unions at Jobcentre Plus have already organised strikes over the job cuts, but Employment Minister Margaret Hodge said the situation was improving. "This report primarily focuses on a period when we recognise Jobcentre Plus experienced difficulties as it implemented a major change programme to improve service standards for customers," she said. "Staff have worked hard to make major improvements since then." The Work and Pensions Select Committee report also criticised the botched introduction of new computer systems. "Getting those able to work off benefits and into jobs is vital for the health of our society," said the committee's chairman Terry Rooney, Labour MP for Bradford North. "Yet Jobcentre Plus has lost focus on its core purpose over the last year. "In their drive for efficiency, the government has caused a serious failure in customer service, staffing, procurement and IT." Liberal Democrat work and pensions spokesman Danny Alexander said it was simply unacceptable for so many vulnerable claimants to be left facing financial hardship. "The government should finally admit the extent of the problems and put the efficiency savings programme on hold until it can guarantee a high quality service to claimants." Conservative MP Philip Dunne, a member of the committee, said the government's ineptitude seemed to know no bounds. "An attempt to cut bureaucracy and waste in much-needed back-to-work schemes has come totally unstuck with both claimants and staff suffering dreadfully."